Made possible through an endowment from the late Patricia H. Snyder, trustee and longtime friend of the University of Evansville, the Patricia H. Snyder Concert and Lecture Series was created in 1997 to bring speakers or performers of national or international renown to Evansville at no cost to the public. The concerts and lectures in this series span a wide variety of topics and are aimed at both the Evansville and campus communities. Events are free and open to the public. Tuesday, April 30, 2019, 7:30 p.m.
André Watts was only 16 when Leonard Bernstein chose him to make his debut with the New York Philharmonic in one of the orchestra’s Young People's Concerts. More than half a century later, Watts remains one of America’s most distinguished and celebrated performing artists. He is a regular guest at major summer music festivals, and has appeared with major United States orchestras and symphonies. Watts’s international engagements have included appearances in Japan, Hong Kong, Germany, and Spain. His 1976 New York recital for Live from Lincoln Center was the first full length recital broadcast in the history of television. Watts’s performance at the 38th Casals Festival in Puerto Rico was nominated for an Emmy Award in the category of Outstanding Individual Achievement in Cultural Programming. His extensive discography includes recordings of works by Gershwin, Chopin, Liszt and Tchaikovsky; recital CD’s of works by Beethoven, Schubert, Liszt and Chopin; and recordings featuring the concertos of Liszt, MacDowell, Tchaikovsky, and Saint-Saens. Watts received a 2011 National Medal of Arts, and in 2006, he was inducted into the Hollywood Bowl of Fame to celebrate the 50th anniversary of his debut. He is the recipient of the 1988 Avery Fisher Prize. Watts was appointed to the Jack I. and Dora B. Hamlin Endowed Chair in Music at the Jacobs School of Music at Indiana University in 2004 and in 2017 was named a Distinguished Professor, the highest academic rank the university bestows upon its faculty. Monday, April 29, 2019, 1:00 p.m.
Wednesday, October 17, 2018, 7:00 p.m.
NASA astronaut Eileen Collins reveals encouraging perspective and insight on the leadership skills needed to break barriers and become a successful pioneer in your field. 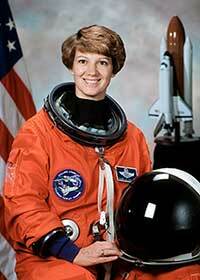 One of America’s most admired women, Col. Collins became the first female to pilot a U.S. spacecraft with the Discovery shuttle flight in 1995, and the first female commander on the 1999 Columbia shuttle flight. In 2005, NASA tapped Col. Collins to command the space shuttle Discovery’s historic “Return to Flight” mission, NASA’s first manned flight following the loss of space shuttle Columbia in 2003. While logging 872 hours in space, Col. Collins earned a reputation for coolness under pressure. With that same calm demeanor, she shares how her career as an astronaut took shape, from her early years in the U.S. Air Force to her ground-breaking experience with NASA. Drawing from her career experiences, Eileen reveals valuable insights learned from both her successes and her failures. From the importance of working with others to achieve lofty goals, to successful leadership in dynamic environments, her perspective inspires you to embark on your own original journey. For audiences interested in space exploration, she can also provide insight into the future of space travel as the world turns to exciting new space frontiers. Tuesday, March 20, 2018, 2:00 p.m.
Dr. Kazee will moderate the panel discussion and contribute his own personal insights as a political scientist. Professors Overby and Sellers are well-regarded scholars of American politics as well as former students of Kazee. A keynote conversation between former Indiana Senator Richard Lugar and University of Evansville President Thomas A. Kazee. This keynote conversation is presented in partnership with the University of Evansville Department of Law, Politics, and Society as part of an all-day series of current events and political science events and discussions, in honor of the retirement of Dr. Thomas Kazee and his academic career as a political scientist. A fifth generation Hoosier, Senator Lugar left the United States Senate as the longest serving member of Congress in Indiana history. Before his election to the Senate, Senator Lugar helped manage the family's food machinery manufacturing business in Indianapolis, served on the Indianapolis Board of School Commissioners, and served two terms as mayor of Indianapolis. During his six terms in the Senate, he exercised leadership on critical issues such as food security, nuclear non-proliferation, energy independence, and free trade. In 1991, he forged a bipartisan partnership with then-Senate Armed Services Chairman Sam Nunn (D-Ga.) to destroy weapons of mass destruction in the former Soviet Union. To date, the Nunn-Lugar program has deactivated more than 7,600 nuclear warheads that were once aimed at the United States. Senator Lugar and his wife, Charlene, were married Sept. 8, 1956, and have four sons and 13 grandchildren. Thursday, October 12, 2017, 7:00 p.m.
Ed Davis is the Former Police Commissioner of the Boston Police Department and current President and CEO of the business strategy and security agency, Edward Davis LLC. 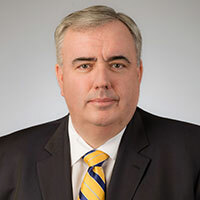 Commissioner Davis was at the forefront of the emergency response to the 2013 Boston Marathon Bombing and the arrests that followed. His experience during the Boston Marathon bombings will be depicted in the upcoming feature film, Patriots Day, starring John Goodman as Commissioner Davis, scheduled to release January 2017. Commissioner Davis has built a stellar reputation on his diverse experience in interagency collaboration and law enforcement on local, state, national, and international levels. His keen insight in cyber security and anti-terrorism, as well as his expert knowledge in crisis management and strategic planning translates across industries. Commissioner Davis’ unique approaches to terrorism, cyber security, and policing have been adopted both nationally and internationally in Singapore, London, Northern Ireland, Jordan, and Israel. Tuesday, April 4, 2017, 7:30 p.m. The Patricia H. Snyder Concert and Lecture Series proudly presents Doc Severinsen and the UE Jazz Ensemble. For 30 years, Doc Severinsen shared our living rooms as the band leader on The Tonight Show with Johnny Carson. Within a week of the final telecast, Doc Severinsen and His Big Band were on the road, and to this day, audiences across America love and respect Doc’s musicianship and repertoire of iconic American music. Join us for an electric evening as Doc Severinsen and the UE Jazz Ensemble, comprised of UE students, perform Ellington and Basie standards, pop, jazz, ballads, and big band classics. Thursday, October 13, 2016, 7:00 p.m.
Made possible by the Patricia Snyder Lecture Series. Tuesday, October 20, 2015, 7:00 p.m. Junior Achievement of Southwestern Indiana and the University of Evansville have partnered to bring celebrity entrepreneur, Daymond John to Evansville. The free public event will be held at 7:00 p.m. on October 20, 2015, at the Victory Theatre in downtown Evansville. The event, An Evening with Daymond John, will serve as both the culmination of JA’s 50th anniversary celebrations as well as this year’s special event for UE’s annual Patricia H. Snyder Concert and Lecture Series which brings renowned speakers to Evansville at no cost to the public. Join us for a conversation with Barbara Pierce Bush and Jenna Hager on the campus of the University of Evansville. Event is complimentary; seating is first come, first served. Saturday, October 19, 2013, 2:00 p.m.
Sunday, November 11, 2012, 2:00 p.m. Featuring David Ilan, director of the Nelson Glueck School of Biblical Archaeology at Hebrew Union College in Jerusalem. This event will be held at Temple Adath B'nai Israel, 8440 Newburgh Road, Evansville. Thursday, September 27, 2012, 6:00 p.m.
Sheryl WuDunn, co-author of Half the Sky: Turning Oppression into Opportunity for Women Worldwide, was the first speaker in the 2012-13 Patricia H. Snyder Concert and Lecture Series. The event on Thursday, September 27, 2012, began at 6:00 p.m. in Eykamp Hall (Ridgway University Center) with an advance screening of PBS documentary Half the Sky, courtesy of WNIN and Independent Lens. WuDunn's speech at 7:00 p.m. was followed by a reception and book signing at 8:00 p.m. The event was free and open to the public.